It's that's time of year again! 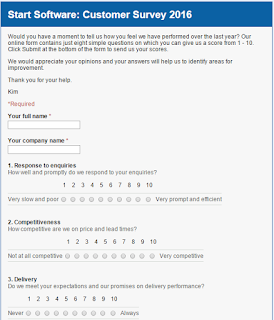 We're asking all customers to give us their feedback. We've also just had our accounts finalised for our financial year ending 30 September 2015.
which makes it our best year ever. Thank you so much for trusting us to be your software partners and a special thanks to our asbestos consultancy customers who have continued to support our Tracker and Alpha Tracker asbestos software systems making them the most widely used packages in the asbestos industry.